What Makes An Ethical Gem Ethical? If you are trying to decide which white metal is the best choice for you and your partner’s wedding rings, I think you’ll agree with me that sorting through information isn’t easy. Should you go with a 14K or 18K white gold wedding ring? What about rhodium plating which makes a gold wedding ring look even whiter? Is palladium a good alternative white metal to platinum? Is a platinum wedding ring worth the extra price given that a palladium looks pretty much the same? After what you read below, you’ll understand these issues enough to be able to make a knowledgeable choice. We will start with the basic question of metal whiteness. How white a wedding ring “needs” to be is something that jewelers have considered deeply for many years. These days, whiteness is determined by a “yellowness index” (YID) developed by Gretag Munsell, which creates color samples for industries as measured by a color spectrophotometer. Yellowness is expressed by a higher color. The whitest metals are ones that are naturally occuring: silver, platinum and palladium. Silver rates the best starting at 7.5. Stainless steel is similar to silver. Platinum rates 9.5 in whiteness. Palladium is part of the platinum family and similar in whiteness to platinum. Most people viewing a platinum wedding ring next to a palladium wedding ring would have difficulty seeing the difference. The main point here is that naturally occurring white metals such as platinum, palladium, silver, and stainless steel are all consistent in their “whiteness”. White gold, however, has a broad range of “white”, from a brighter white which has little yellow to a white that leans toward beige. The first thing to understand is that white is not gold’s natural color. Therefore, whiteness is determined by the amount of white alloy in the ring. The more alloy as a percentage, the greater the whiteness. A 14K white gold wedding ring, which is .585% gold and 41.5% alloy is going to be more white than an 18K white gold, which is 75% yellow gold and 25% alloy. Now, jewelers always want to sell you a higher priced ticket, so they push customers toward 18K white gold. Need a merge these sentences better. In the past, alloys were not stable and the rings yellowed over time. So, they came up with rhodium plating. Rhodium is a naturally white metal in the platinum family. A coat of rhodium is put on a white gold ring to make the ring look more like platinum. The big disadvantage of rhodium plating is that is not lasting and it can also be a toxic process. These issues are debated by jewelers in this article I posted years ago on my Fair Jewelry Action website. We do not recommend it. What a hassle and scam to be convinced to have to re-plate and maintain your wedding rings! This handmade wedding ring, the WIndsor, is crafted entirely from white gold. 3. How White Is White Enough In A White Gold Wedding Band? One jeweler’s white gold may not be the same as another jeweler’s white gold. But the question is, does it really matter? Therefore, if you want a very white color, we recommend 14K white gold wedding rings over 18K white gold wedding rings. The 14K white gold wedding is also stronger and more durable than 18K. If you want the caché of having a higher carat gold, then go with 18K. 4. What Alloys Are Used In White Metal Wedding Rings? Alloys make precious metal more suitable for jewelry production. We’ve already covered how alloys impact white color. Alloys also make wedding rings more durable. Supply houses have their own variations of alloys and some are even patented. Hence, the list below is a broad view of alloys generally used without getting too technical. Both palladium and platinum are 95% pure white metal then are alloyed with white metal. Platinum alloy includes cobalt, iridium or ruthenium. Palladium is alloy combined with ruthenium. Sterling silver is .925 pure. The rest is copper. In the US, white gold wedding rings are alloyed with nickel and silver. In the UK and much of the EU, white gold wedding bands are alloyed with palladium. Palladium is more expensive than silver and nickel, which makes palladium white gold rings higher quality and about 20% more expensive. Silver and nickel as alloys are inexpensive but the price of palladium is around the same cost as 14K gold. Why go with a palladium alloy? Some people are allergic to nickel, and so provides an alternative. Very occasionally, we have customers who are allergic to the nickel in white gold wedding rings. If you are at all concerned about this issue, it’s best to go with a palladium white gold alloy mix. Palladium and platinum are considered hypoallergenic. Silver allergies are also very uncommon, but some people. The Flores wedding ring is shown here in white gold adorned with diamonds. Small accent gems in white gold wedding bands can enhance design with scintillating sparkle. Some jewelers believe that diamonds look best in platinum because its natural white color does not reflect into the gems. Platinum is the most expensive product and jewelers generally will want to upsell you on this feature. However, gems and diamonds look amazing in white gold and silver too. We don’t feel that there is a significant difference in how gemstones look in palladium and platinum versus white gold or silver to make this factor important in the decision making process. This graph shows the various hardness levels pertaining to the rings alloys. The next matter is durability, which is determined by the hardness of the white metal. Naturally, we want our rings to last a lifetime, so this is an important concern. Durability is determined by the hardness of the metal, which this chart below illustrates. Hardness is based on the MOH scale, which you might remember from high school science. Talc is number one, while diamonds are rated ten. One of the benefits of a platinum ring is its hardness. However, palladium (which is in the platinum family) is slightly more durable than 14K white gold. A well made, 14K gold ring will last a lifetime. Eighteen karat white gold is considerably softer, reflecting the malleability of gold. But even a well-made 18K gold will hold up just fine. Making wedding rings from stainless steel is a relatively new option. There are many types of stainless steel used in rings, we recommend type "316l", white is commonly used in medicine for implants. It will never rust, is highly durable, hypoallergenic, light weight, nearly impossible to scratch and extremely resistant to damage. Stainless steel rings, as shown in the chart above, are the most durable of all white metal choices. One issue against stainless steel is that gemstones cannot be set in the ring. Silver is a soft metal, but some people do prefer silver wedding rings and they will hold up fine particularly if they are made thick and heavy. Any gemstone can be set in sterling silver. One of our artcarved platinum wedding bands adorned with diamonds. Cost is determined by the complexity of design, materials, customization, shop costs and whether the ring is made in the US or abroad where labor is less expensive. Generally, platinum wedding rings are the most expensive option, followed by 18K white gold wedding rings. A 14K white gold wedding ring is going to be comparable to a palladium white gold wedding ring. The processes involved in making stainless steel wedding rings or silver wedding rings can be as expensive as making a ring out of precious metal. This is particularly true if the ring is made in an artisan studio and not just dye stuck and mass-produced in a machine shop. Labor and shop costs remain the same. Stainless steel and silver rings will generally be considerably less expensive than gold or platinum rings simply because the material costs. The Pinwheel ring, is available in many white metals, such as silver wedding rings. No one would want to purchase a wedding ring which in its production destroyed ecosystems and exploited communities, but unfortunately this is the norm. Platinum and palladium wedding rings can be made of recycled metals. Though using recycled precious metals has no impact mining practices, at least there is a symbolic effort. The most ethical wedding rings are made of Fair Trade gold. Fair Trade gold and Fair Trade silver offers the best chance for small-scale miners to work their way out of exploitation and poverty. The Fairtrade gold certification is an independently audited set of benchmarks created by Fairtrade International. The commercial platform with its standards and principals connect retailers to miners through a transparent and traceable supply chain. The result is that artisanal small-scale miners (ASM) are empowered to improve their livelihoods. Retailers and consumers are given assurances that the miners are fairly compensated for their efforts and that the environment around the mine is not contaminated with mercury or cyanide. The bottom line is, if you really care about making a real difference in the world with the purchase of your wedding rings, choose Fairtrade gold or silver. 11. 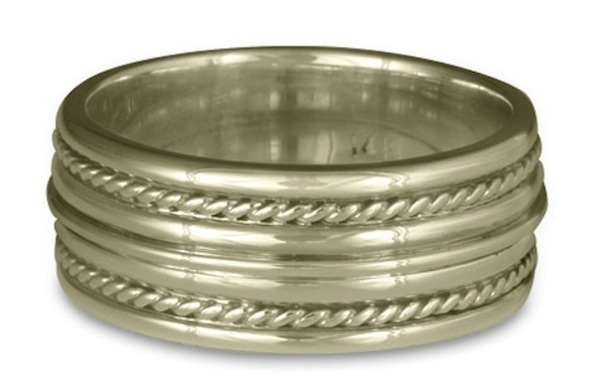 Which Is The Best White Metal Wedding Ring For You? A platinum wedding has tremendous brand cache and it is often the first choice for those who can afford it. The cost of platinum makes it more desirable. It conveys status and wealth. Some people prefer silver over gold, but the drawback is that silver is a relatively soft metal and shows its wear over time. Some people like how silver wears. Stainless steel has many advantages but many people simply do not relate to steel as a material for wedding rings. Palladium wedding bands are harder, purer and whiter than white gold wedding bands. Like platinum, it conveys a cool and modern style. One question might be, why choose 14K white gold over palladium given that they are within the same price range? Part of the answer is that palladium is not as well-known as an option. Yet there is another highly subjective factor: feeling tone. Gold is the alchemists dream and represents a spiritual essence. It has always been associated with the sun and warmth. Gold wedding rings are also very, very traditional and are passed down over generation. Some people choose gold because it feels right. Ultimately, which white metal is best for you is highly subjective. It’s a matter of choosing which factors among cost, color, durability and ethics are most important to you.